The Zoo sends dozens of employees across the globe to conduct research, participate in animal rehabilitation and implement conservation programs to better the lives of animals and ecosystems. 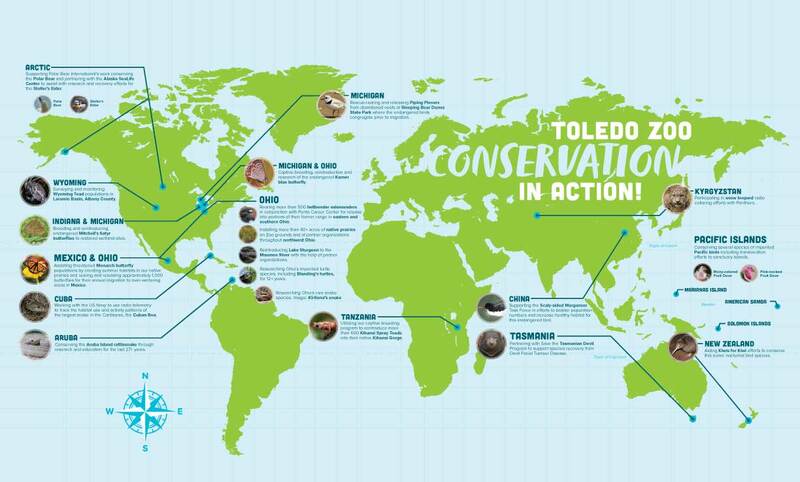 The Zoo doesn’t forget about its own backyard though, as our Wild Toledo program does unique conservation work in northwest Ohio. 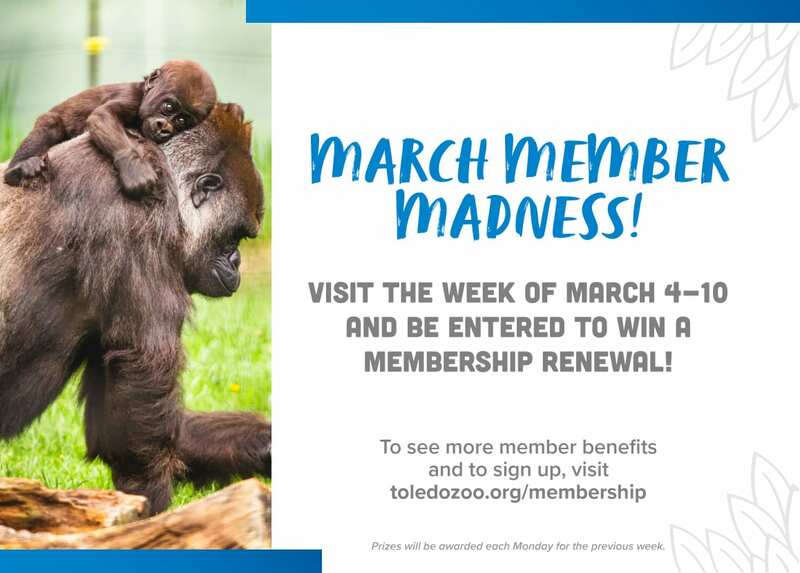 As a visitor, member, volunteer or employee at the Zoo, it is easy to see and appreciate the world-renowned conservation efforts put forth by the Toledo Zoo. 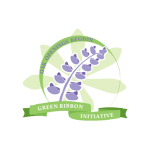 We participate in and support conservation efforts around the world. Anyone can be a Citizen Scientist! 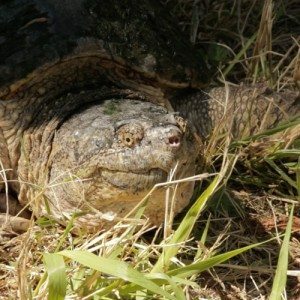 Upload images of reptiles or amphibians that you encounter while out on your adventure. 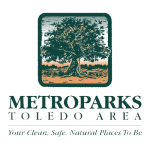 Adding beauty and other benefits throughout northwest Ohio. 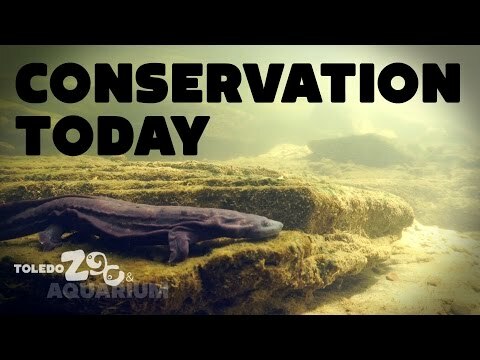 The Toledo Zoo, a member of the Ohio Hellbender Partnership (OHP), is rearing hellbenders for release in southeastern Ohio. The eastern hellbender, Cryptobranchus alleganiensis, is a state-endangered species, with pollution and loss of habitat eliminating wild populations throughout much of their historic range. Hellbenders need clean and siltation free streams for survival. 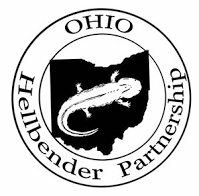 Today, some of Ohio’s streams have recovered and can again support hellbender populations. The Zoo helps by collecting eggs in these streams and transporting them back to the Zoo for rearing, where survivability of the young can be much higher than in the wild. Some of these young hellbenders are later released in the same creeks and streams in which they were collected, while others are used to repopulate streams that supported hellbenders in the past. 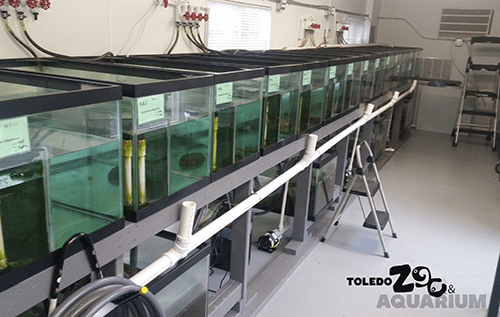 The Zoo also partnered with Penta Career Center in Perrysburg, Ohio to establish a bio-secure room with aquariums to headstart hellbenders and give high school students the opportunity to learn hands-on husbandry of hellbenders. 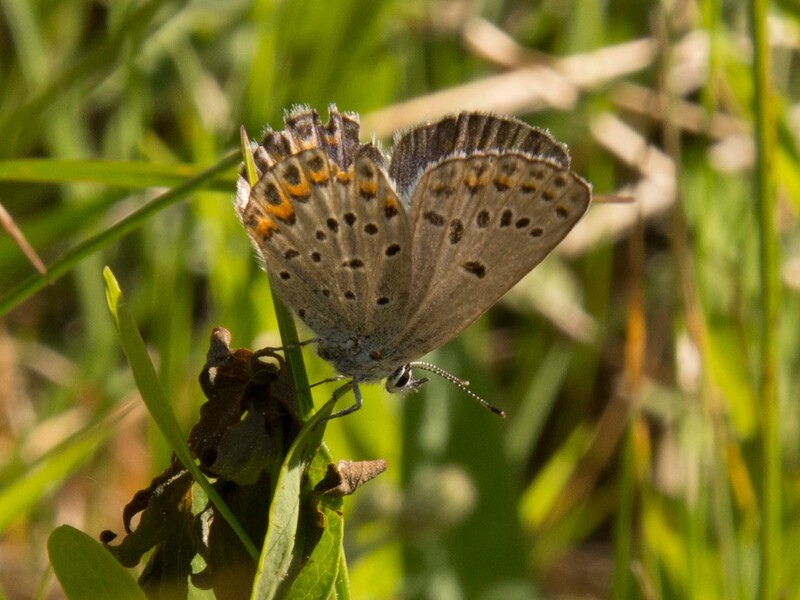 The Karner blue butterfly (Lycaeides melissa samuelis) was listed as an endangered species in 1992 because of habitat loss and loss of the flowering plant lupine, of which this animal depends on for its life cycle. This butterfly is a symbol of the Oak Openings Region and was last seen in Ohio in 1988 but was reintroduced in 1998. 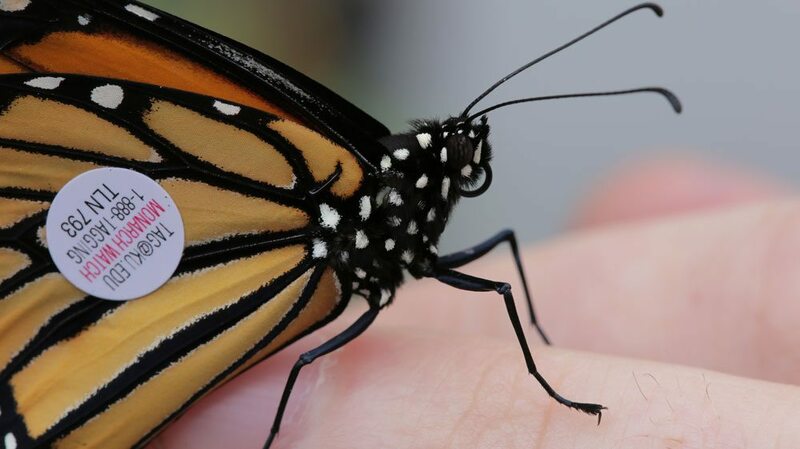 Toledo Zoo is working to protect these butterflies by completing population counts and vegetation analysis in particular habitats to assist conservation efforts in Michigan. One of the world’s rarest butterflies, the Mitchell’s Satyr is found exclusively in fen habitats in Michigan and Indiana. 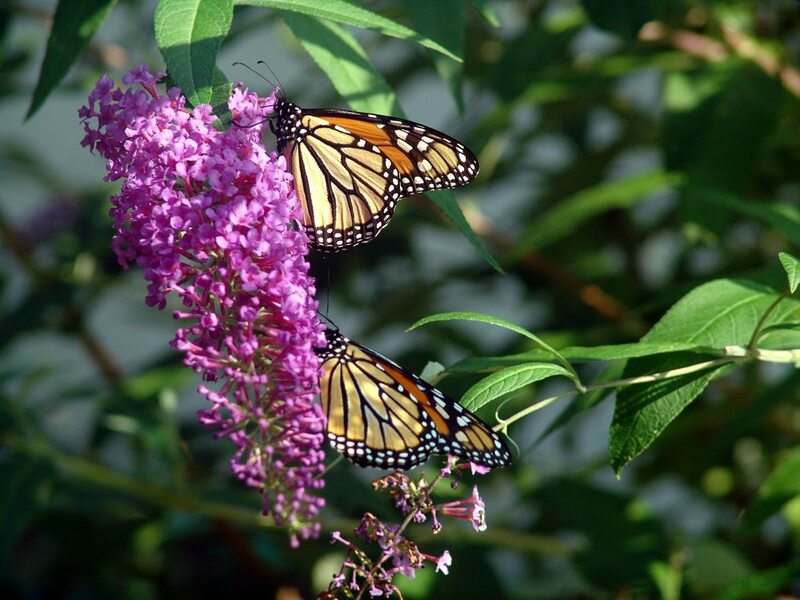 These butterflies are listed as an endangered species because of habitat loss as they require a specialized wetland habitat found in prairie fens for survival. 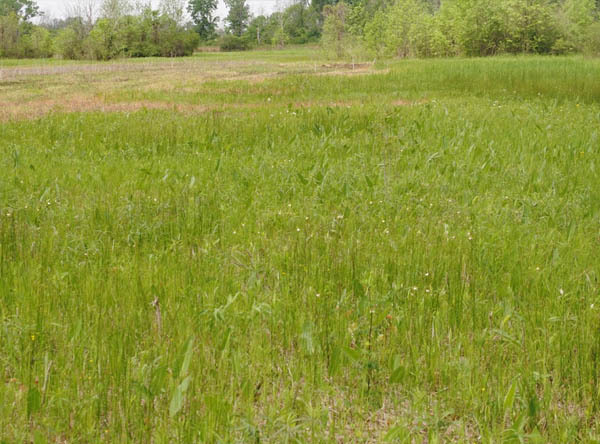 Draining and altering of these fens for agriculture has decimated the Satyr population. Mitchell’s satyrs are collected in the wild, then brought back to the Zoo to lay their eggs on sedges in specialized enclosures. The adults are then released back where they were collected. Unfortunately, over the past 15 years, Monarch butterfly (Danaus plexippus plexippus) populations have shown huge declines as illegal logging threatens their overwintering range, and milkweed (the monarch host plant, Asclepias spp.) becomes increasingly rare across their northern summer range. 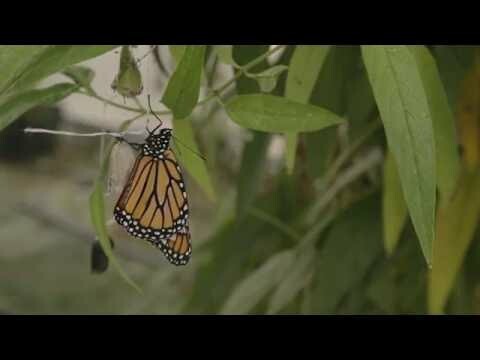 In recognition of the monarchs’ plight, the Toledo Zoo has started breeding the butterflies for release. Early in the summer of 2014, biologists collected 25 eggs from milkweed plants at the Zoo and reared the butterflies on milkweed grown by Wild Toledo staff. These individuals were then bred and their resulting offspring reared for release into the wild to complete their annual migration to Mexico. Toledo Zoo constructed a modular facility on Zoo-owned property near the Maumee River to headstart lake sturgeon. We expect to rear thousands of lake sturgeon from eggs collected in U.S. and Canadian waters until the fish are approximately six months old. At that point, the sturgeon will be released into the Maumee River and their population monitored by fisheries biologists with the Ohio Division of Wildlife and U.S. Fish and Wildlife Service. 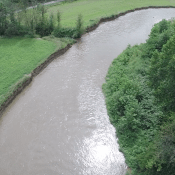 The goal is to rear the fish in Maumee River water from a young age and capitalize on the homing ability of the species in hopes that they will return to the waterway to spawn at adulthood in approximately 20 years. 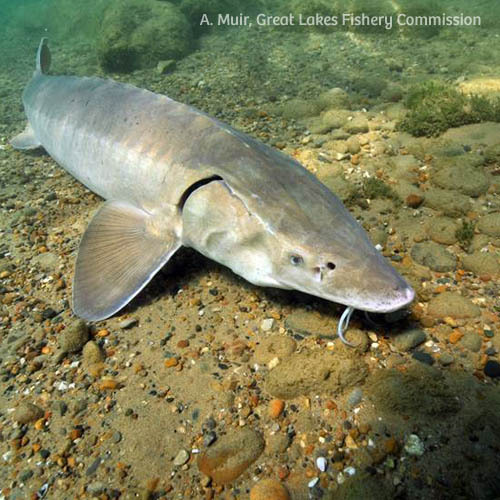 In the 1800s, lake sturgeon were abundant in the Maumee River, however, demand of caviar and fuel along with commercial over fishing caused the population to decline and ultimately disappear. 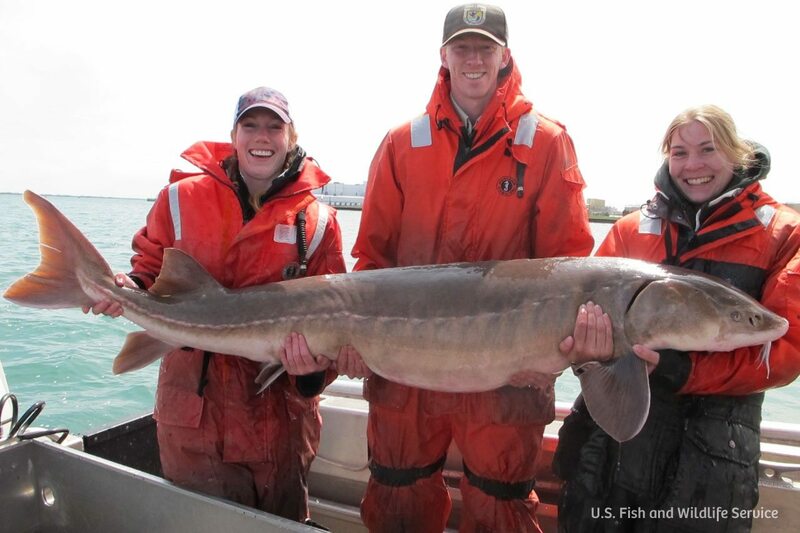 Currently, Ohio doesn’t have a reproducing lake sturgeon population. 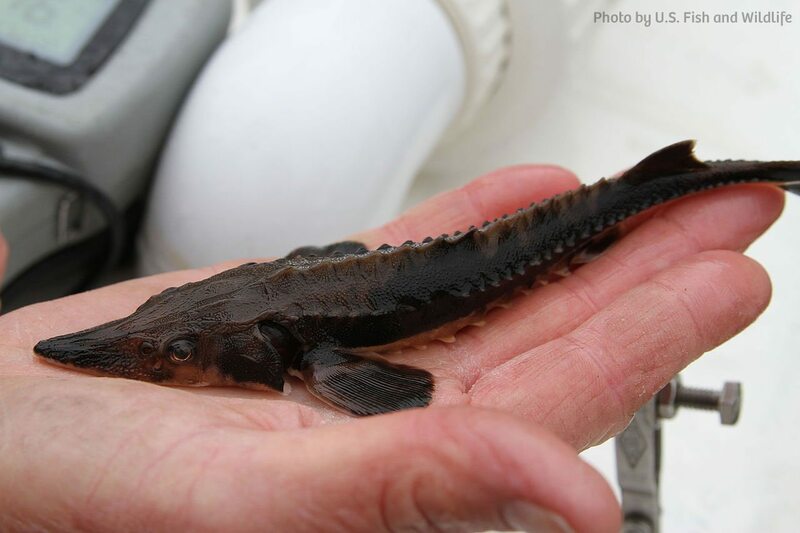 Find out more about the upcoming Lake Sturgeon Release and read about Lake Sturgeon reintroduction to the Maumee River. Mesopredators are medium-sized predators whose populations often increase when their larger predators are eliminated. Locally, these are raccoons, opossums and skunks. 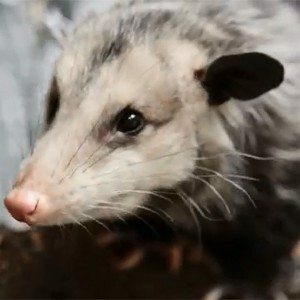 Through the Wild Toledo initiative, we are attempting to establish a healthy non-reproductive population of resident skunks, opossums and raccoons: animals which would otherwise present a disease concern to our animal collection. 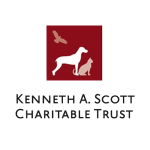 We are health-assessing, vaccinating and surgically sterilizing them through a grant we received from the Kenneth Scott Charitable Trust. We are also putting global positioning satellite (GPS) logging collars on a few animals to determine the population’s geographic range, as well as learning more about urban mammal species and the critical components of their habitat. 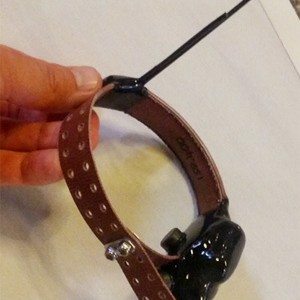 These collars turn themselves on multiple times during the night and note the animal’s location. 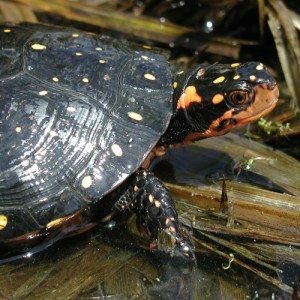 Wild Toledo is evaluating local turtle populations in the Toledo-area wooded areas and marshes through mark recapture techniques with painted turtles, common snapping turtles, spotted turtles and Blanding’s turtles. 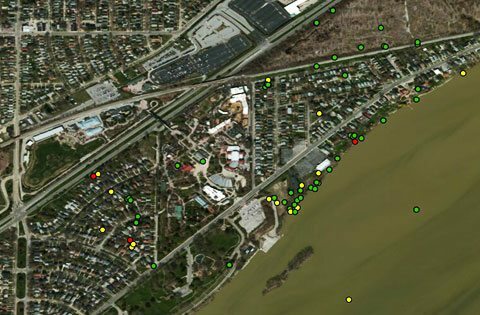 This data will allow Wild Toledo biologists to determine the population health of these species by providing insight on size, weight and number of turtles in each study location. 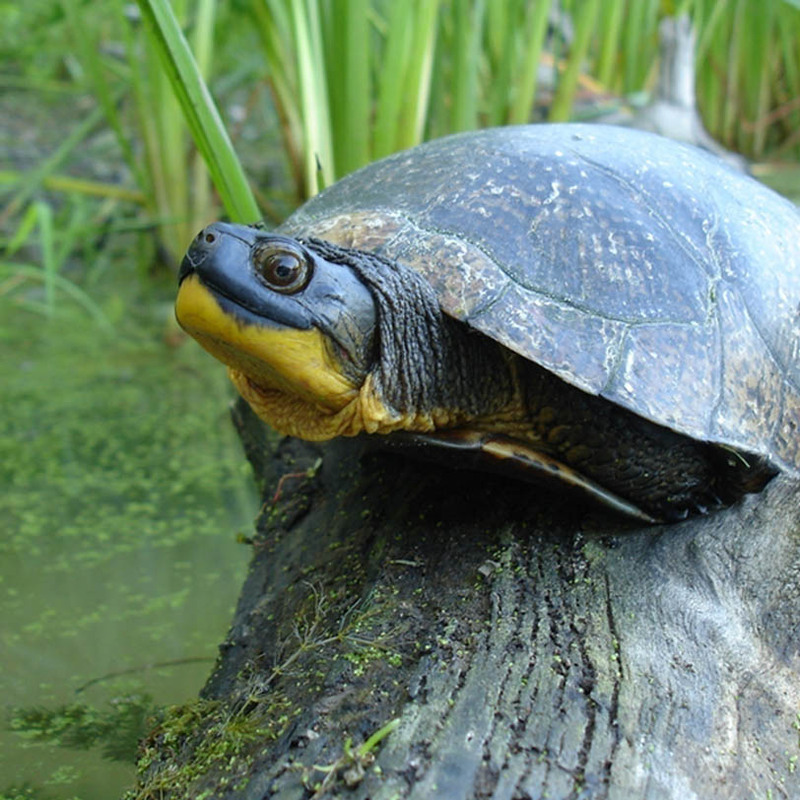 Biologists also use radiotelemetry to find turtles in their environment. Turtles are previously caught and are outfitted with a transmitter and released back in to their habitat. They are then tracked once a week to see how they are using that habitat. 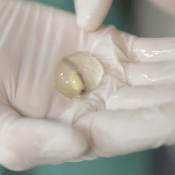 The transmitter is harmlessly attached to the shell with an epoxy that can be removed later on. The antennae is situated behind the turtle and is flexible to allow the turtle to move unrestricted. 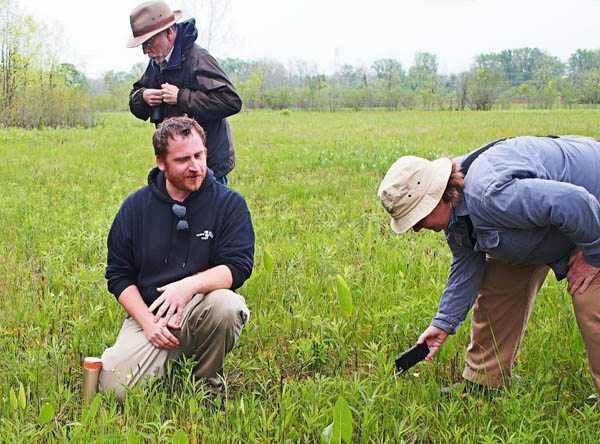 Additionally, in our native prairies, Wild Toledo biologists have seen red-backed salamanders (Plethodon cinereus), five-lined skinks (Plestiodon fasciatus), brown snakes (Storeria dekayi), common water snakes (Nerodia sipedon sipedon) and Butler’s gartersnakes (Thamnophis butleri). Anyone can be a Citizen Scientist! Participation only requires you to go outside and explore. 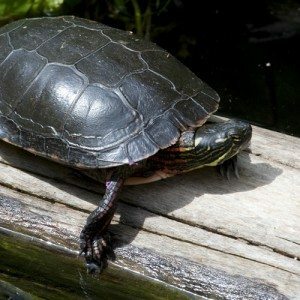 Upload images of reptiles or amphibians that you encounter while out on your adventure. Zoo staff will catalog and update our map of native species distribution. 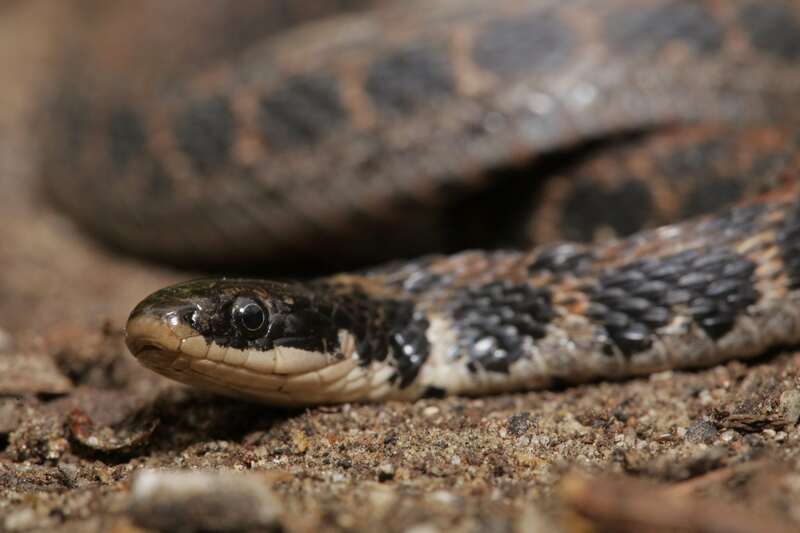 We have joined statewide efforts to assess the status of the Kirtland’s snake (Clonophis kirtlandii). 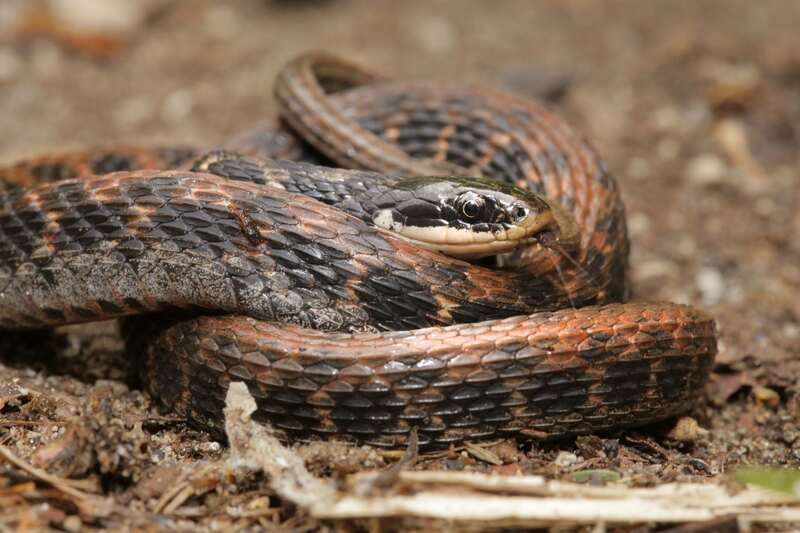 These snakes typically inhabit wet prairies and are extremely difficult to find because they appear to spend the majority of their time underground in crayfish burrows. 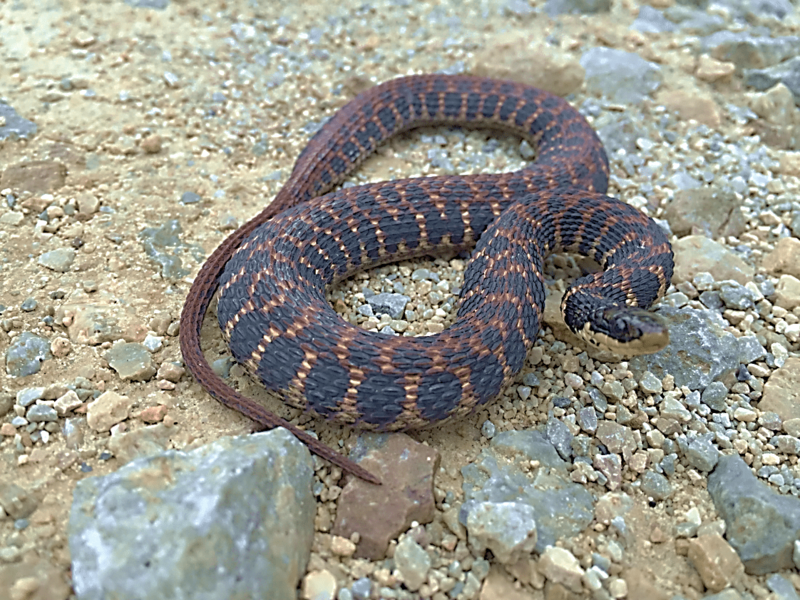 Typical cover object surveys have proven successful for finding Kirtland’s snakes, but the periodic flooding or drying of the wet prairies can make this method unreliable. To overcome this obstacle, Wild Toledo researchers have partnered with Dr. Andrew Gregory at Bowling Green State University to use environmental DNA (eDNA) to detect these elusive snakes. 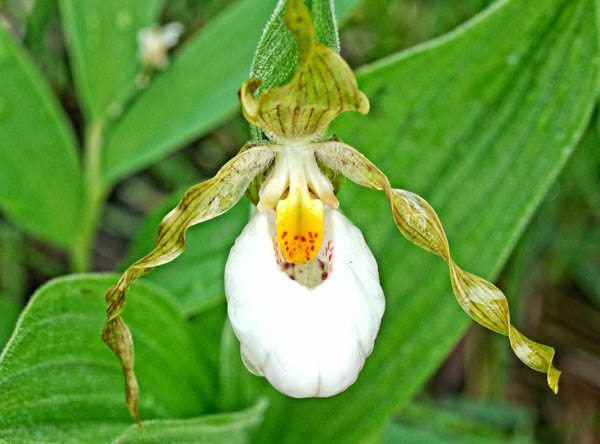 White Lady’s Slipper (Cypripedium candidum) is a type of flowering plant that belongs to the Orchid family. Orchids are characterized by having vibrant and intricate flowers that often have a pleasant fragrance. The White Lady’s Slipper is a food deceptive flower, meaning the flower advertises a food (nectar) reward to pollinators while not providing one. This unique floral adaptation reduces the likelihood of self-pollination and dramatically decreases the rate of pollination. 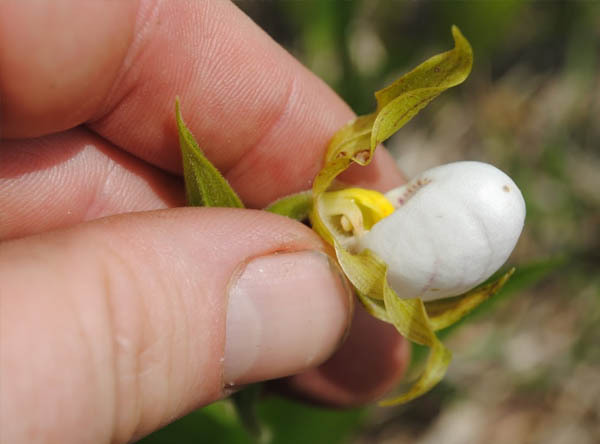 In Ohio, the White Lady’ Slipper is limited to three disjunct populations, two of which are at considerable risk of becoming extirpated because of declines in native prairie habitat due to agriculture and urbanization. 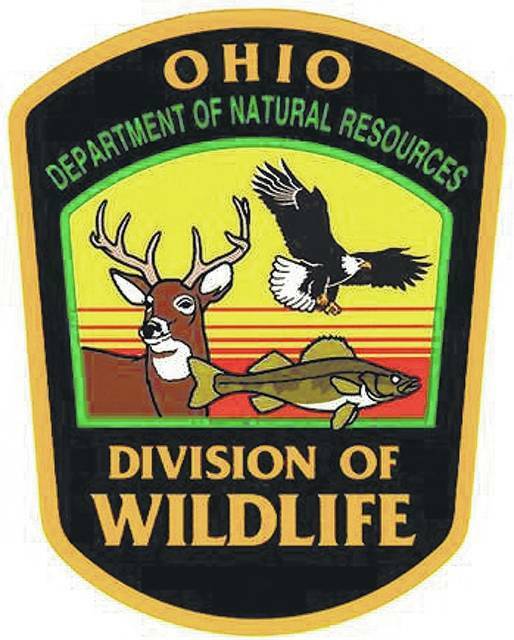 These factors have resulted in the species being listed as endangered in the state of Ohio. The Toledo Zoo is working on a plan to prevent the extinction of this flower by conducting research in situ (natural habitat) and ex situ (in a lab) with the eventual goal of reintroducing additional orchid plants into their native habitat. Global Positioning System (GPS) technology is one of the many methods used to monitor animal movements. 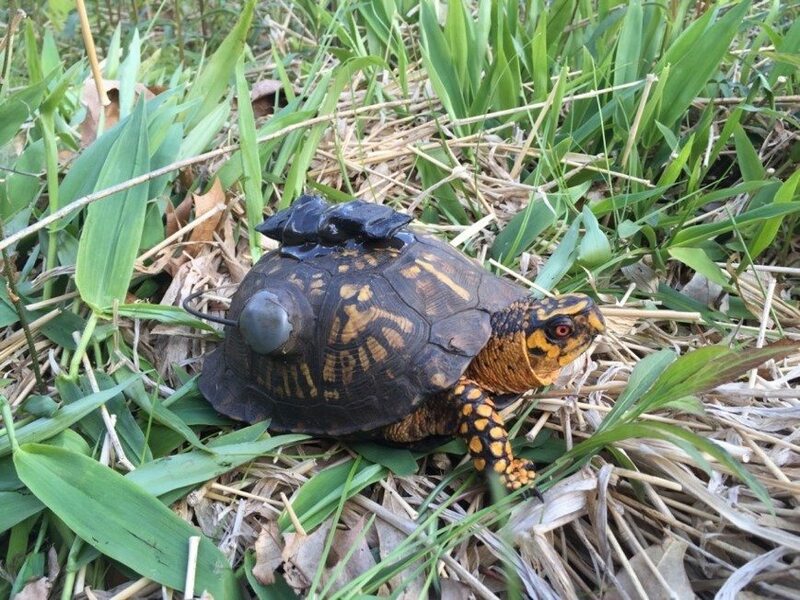 We have used GPS loggers to track mesopredators, Blanding’s turtles, spotted turtles and box turtles. However, these loggers are often expensive, upwards of ~$2,000 and the number of animals we can track this way is typically limited. Recently, we partnered with Patrick Cain, an instructor at Georgia Gwinnett College, to make our own GPS loggers at the Zoo. These loggers lack the bells and whistles of their commercial counterparts, but at ~$50 per unit, we can deploy them on many more individuals. Currently, we are tracking 23 box turtles outfitted with GPS loggers and anticipate putting these loggers on all of our radio telemetry turtles. 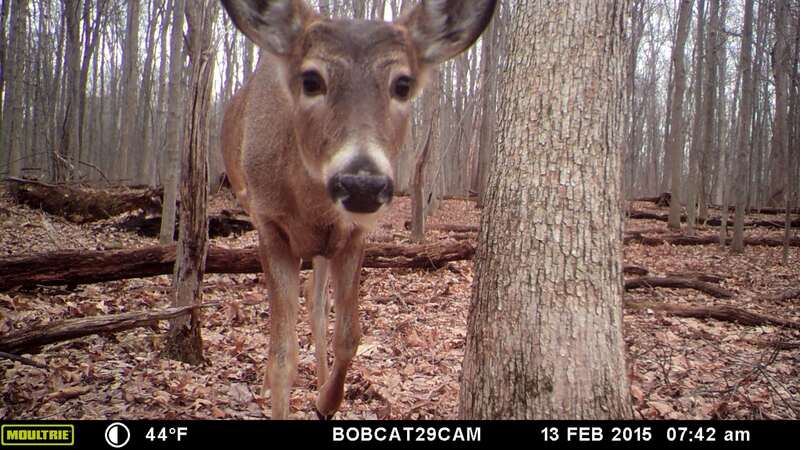 We have established an intricate web of trail cameras in order to monitor animals that live and move within the Green Ribbon Corridor, which ranges from Secor Metropark south to Maumee State Forest and through Oak Openings Preserve Metropark. 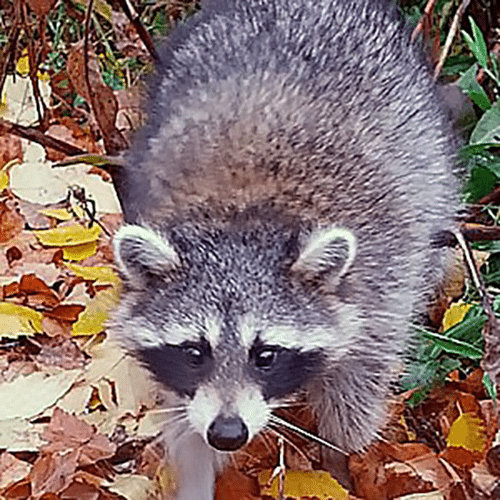 This project helps determine the absence or presence of many animals, including bobcats, badgers, turkey, black bear, coyote, deer and mesopredators like raccoons, skunks and opossum. 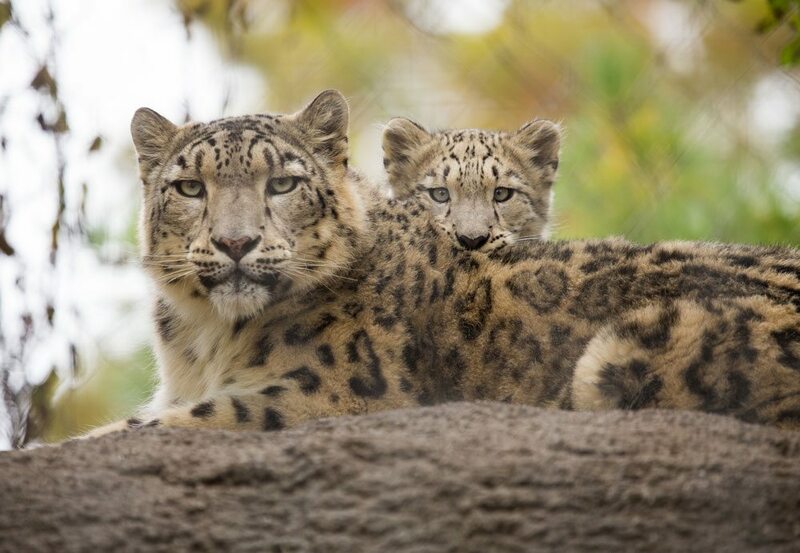 Learn about the Zoo’s sustainable practices and initiatives. 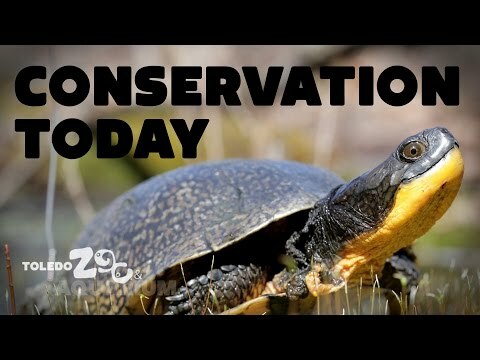 Learn how you can conserve the natural world through these helpful tips. From butterflies in our own backyard to tiny toads in Tanzania and giant polar bears in Canada to feathered friends throughout the Pacific Ocean, your Zoo is working to create a better world for all living things. Kihansi Spray Toads – June 5 at 6 p.m.
Lake Sturgeon – September 18 at 6 p.m.
Tasmanian Devils – November 6 at 6 p.m.
For more information, please reach out at 419-385-5721 ext 2083. 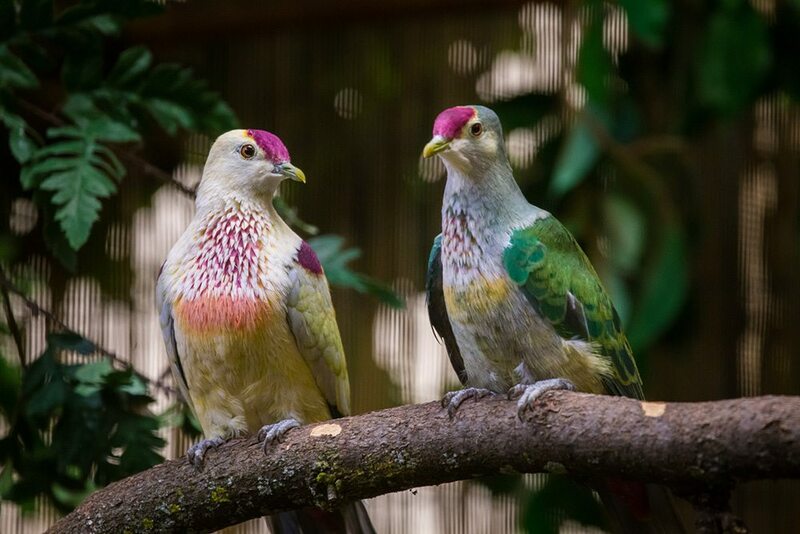 Many-colored fruit doves are native to American Samoa, Fiji, Samoa and Tonga. The global population size has not been properly quantified, but the species is reported to be uncommon, localized and decreasing. These little birds have been observed in small flocks in the canopy of banyan trees, where they eat the fruit the tree produces. Unfortunately, with the current rate of these trees being cut down for human expansion, relying on such a threatened food source could soon be very harmful to the longevity of the species. 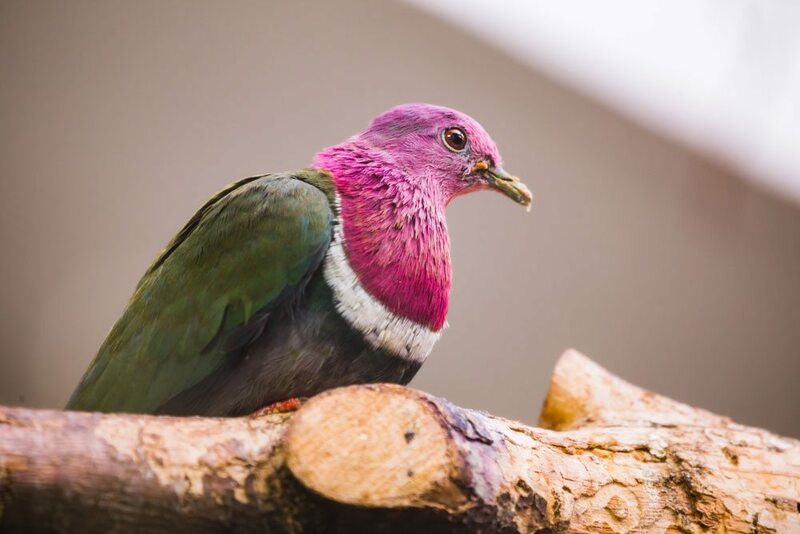 In October of 2016, four male and four female Many-colored Fruit Doves or Manuma, were transported from Pago Pago, American Samoa to the Zoo. 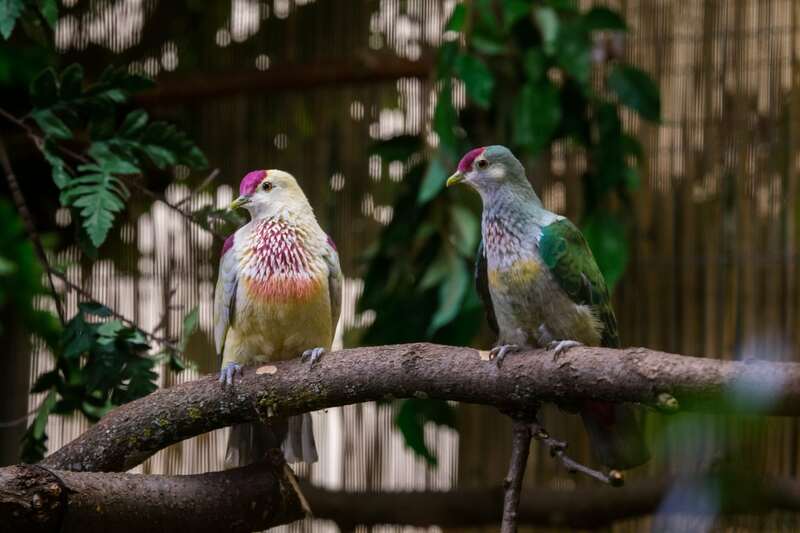 The birds underwent an acclimation and quarantine period of approximately 60 days and were then set up in pairs to breed in our off-exhibit Avian Breeding Center. 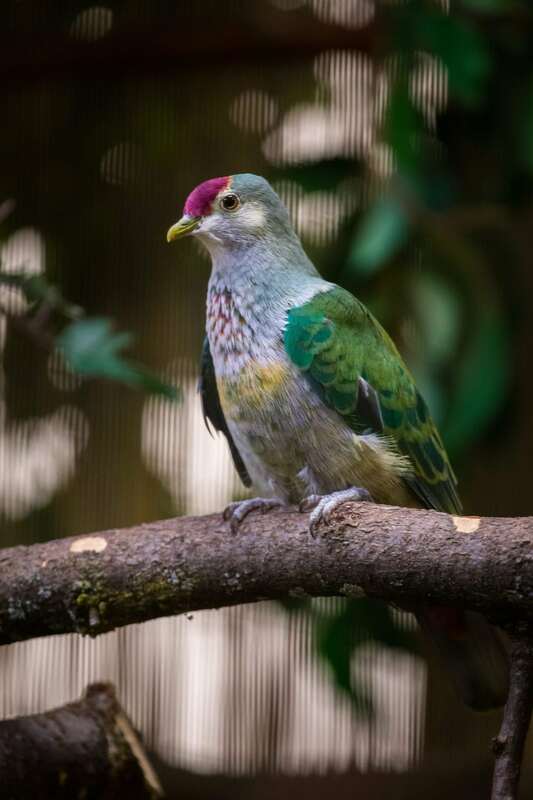 To date, four Many-colored Fruit Dove chicks have hatched at the Zoo. 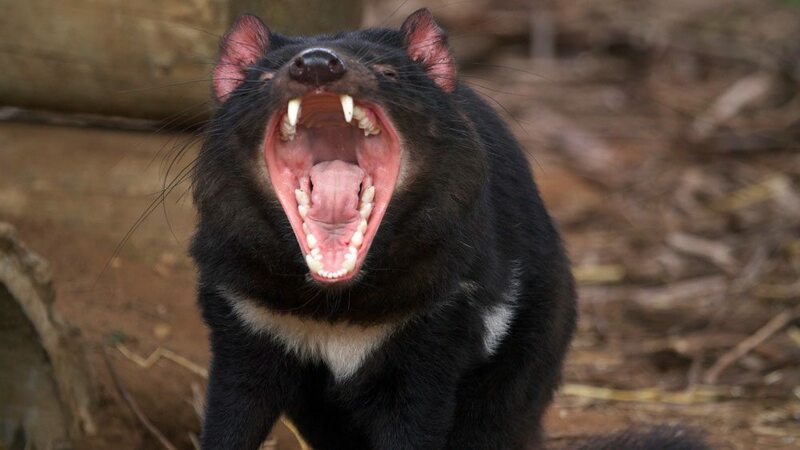 Tasmanian devils are the largest living carnivorous marsupial. Males weigh about 18 pounds and average two feet in length while females weigh about 13 pounds and average 20 inches in length. 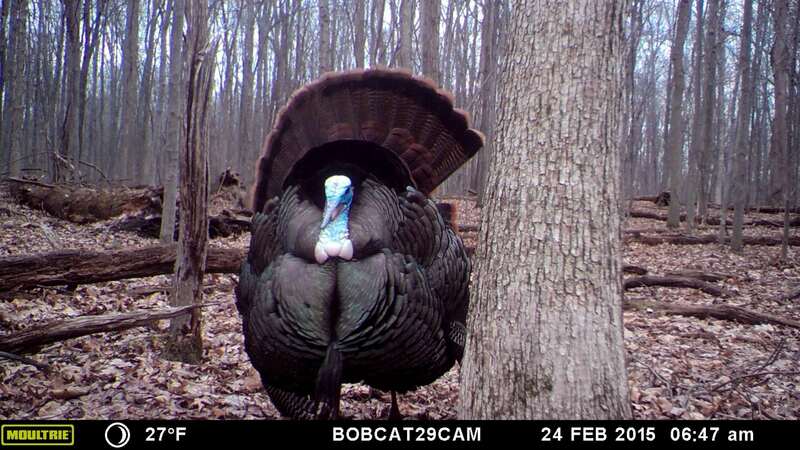 They are black all over with white marks on their chest and sometimes on their rumps. 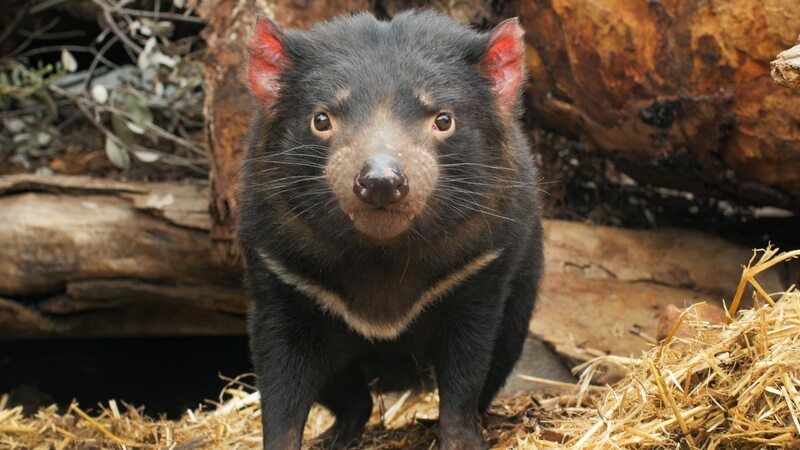 Tasmanian devils eat small mammals and birds and are only found on the island of Tasmania, not mainland Australia. Their foreboding expression, black color and terrible scream helped earn the “devil” nickname. 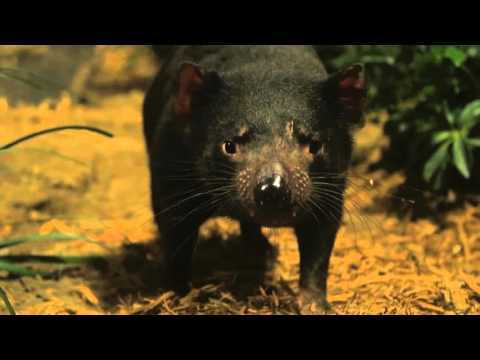 We are partnering with Save the Tasmanian Devil Program to help study and conserve this iconic species. 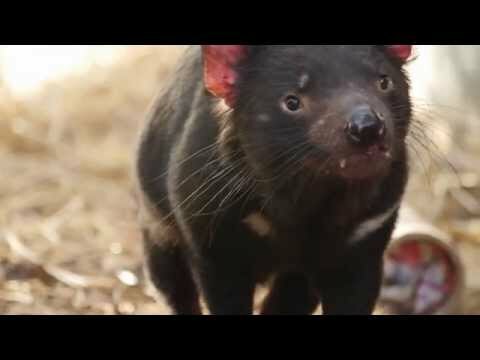 In recent years, Tasmanian devils have seen a rapid decline in wild populations due to cancerous facial tumors that are spread through infected cells dropping from one devil into an open wound of another during shared, ferocious feeding of a kill. 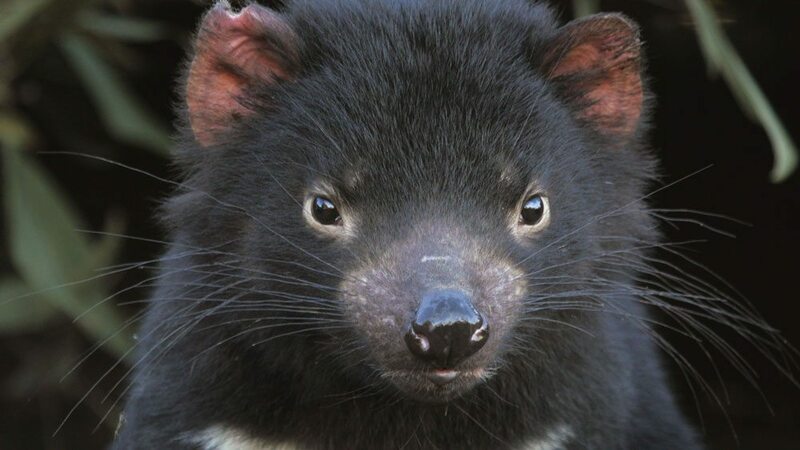 It is estimated that 90% of wild devils have died from this disease, leading devils to be listed as an endangered species. 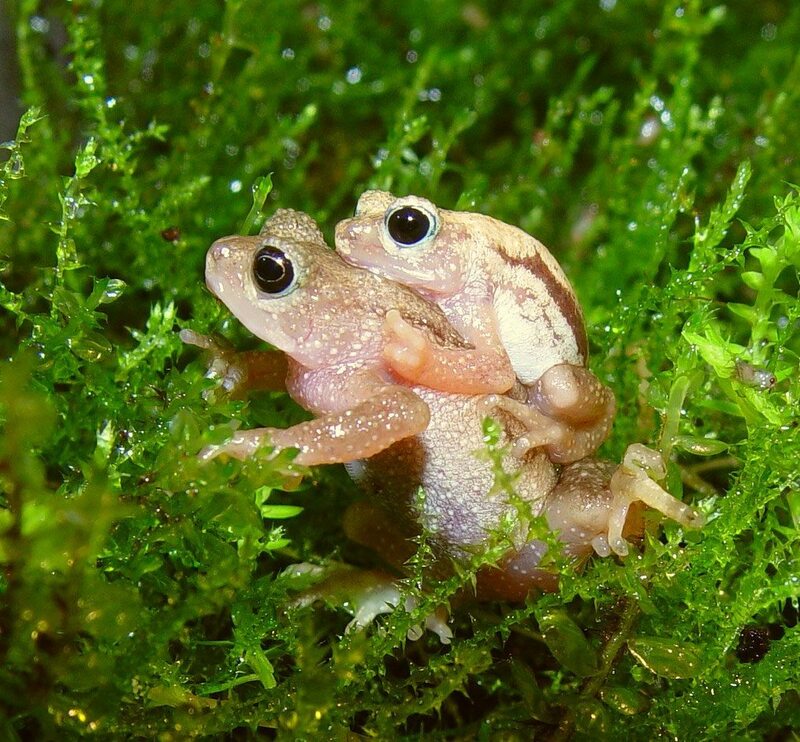 The Kihansi spray toad (KST) is a tiny, goldenrod colored amphibian that is native only to the spray zone (where the falling water meets the rocks) of the waterfall in the Kihansi Gorge in Tanzania. Kihansi spray toads went extinct in the wild 2003-04, as the developing country looked for ways to spread electricity to its people. The building of hydroelectric facilities on the Kihansi River drastically reduced the water flow of the KST’s native waterfall, causing the entire toad population, some 30,000, to congregate in the extremely small remaining spray zone. At that point, conservationists from across the globe took notice and action to create an assurance population. 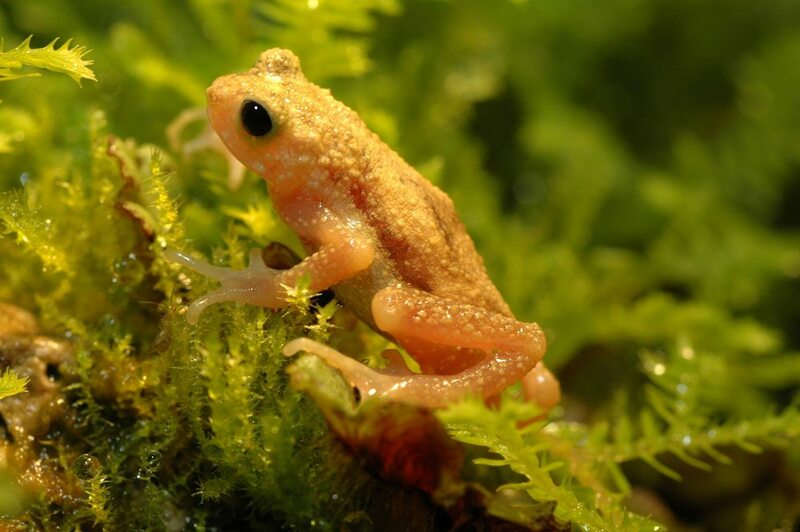 After some trials and tribulations, Toledo Zoo and the Bronx Zoo are now recognized as leaders in Kihansi spray toad conservation. Periodically, the Zoo ships 500-1,100 toads reared in its captive breeding program back to Tanzania to be reintroduced into their native Gorge. 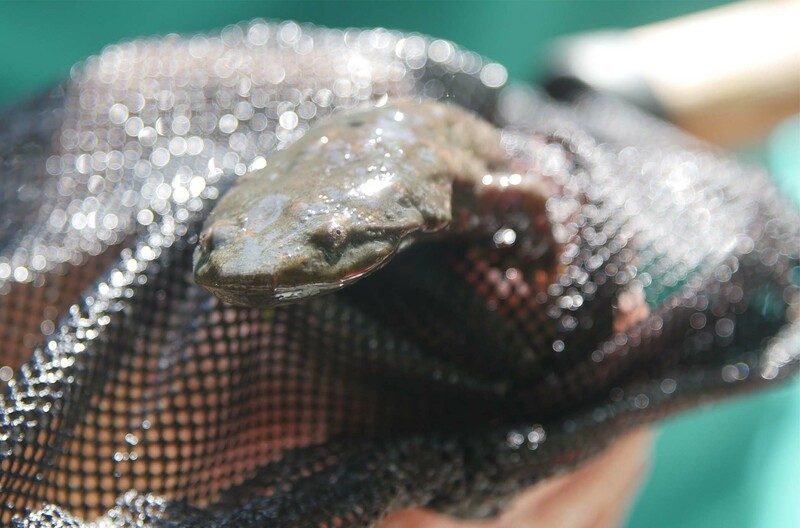 So far, Toledo Zoo has helped release over 5,000 toads back into the wild. The tiny toads continue to be observed in the Gorge, giving researchers reasons to be optimistic that the wild population can become self-sustaining in the near future. 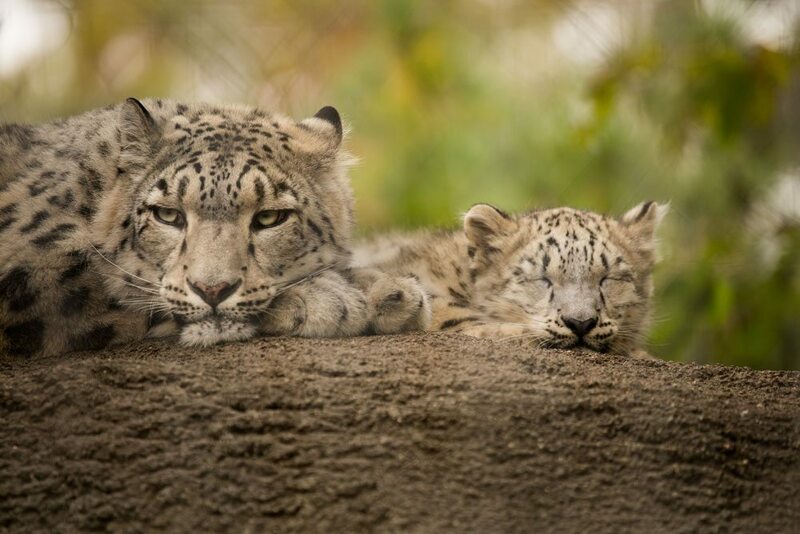 Snow leopards have pale green, grayish white coats with large black spots and a long tail. They are native to the mountains of central Asia and are endangered due mainly to human-wildlife conflict, specifically retaliatory killings for preying upon farmers’ livestock along with climate change and human encroachment. Current estimates of the wild population are 4,000 – 6,600 and declining. 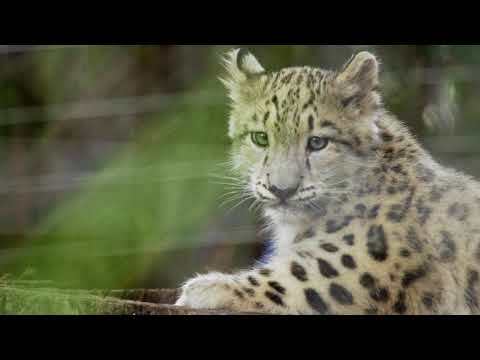 Zoo staff works with big cat conservation group Panthera to radio collar snow leopards in Kyrgyzstan. 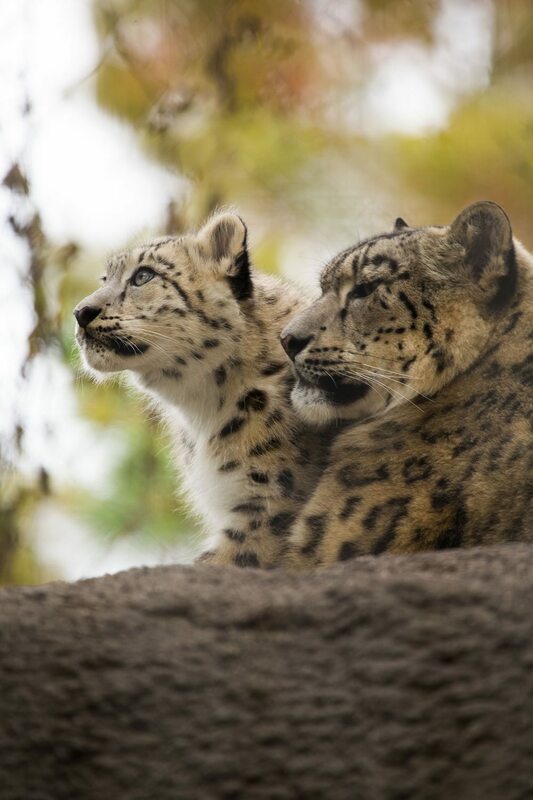 In 2016, the work in remote conditions proved incredibly successful as they were able to place GPS tracking collars on two new male snow leopards. 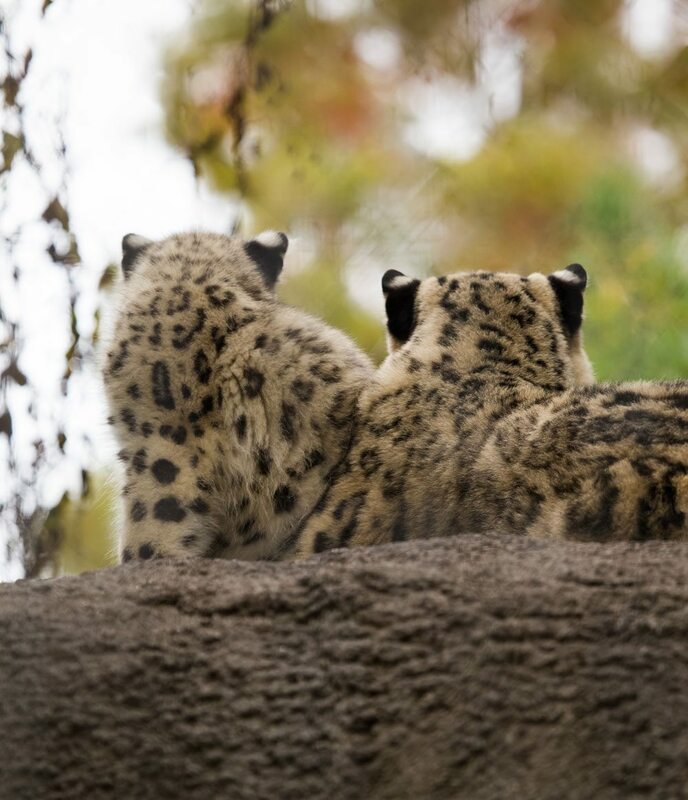 The collar sends satellite signals that pin point the snow leopard’s location. This allows researchers to track the cat and for the first time learn about the daily activities and habits of the rarely seen creatures. 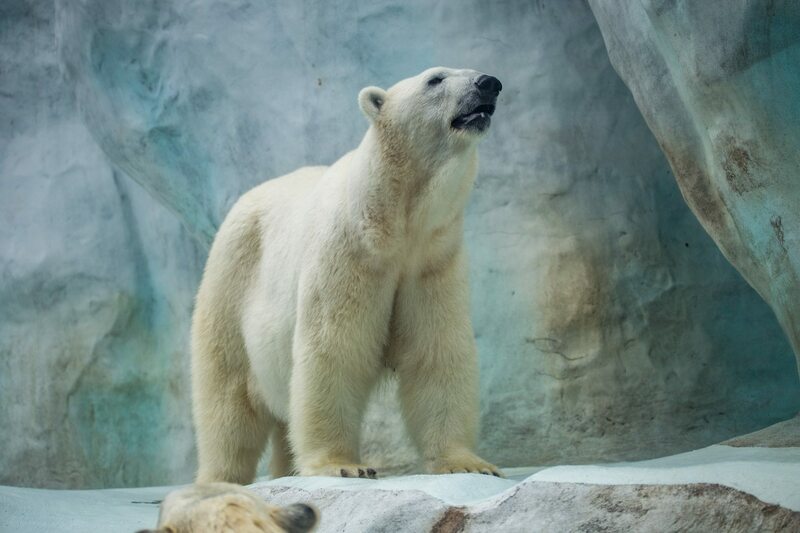 Polar bears are the largest carnivorous land mammal on earth and have no natural predators, except humans. They are native to Canada, Alaska, Russia, Norway and Greenland. 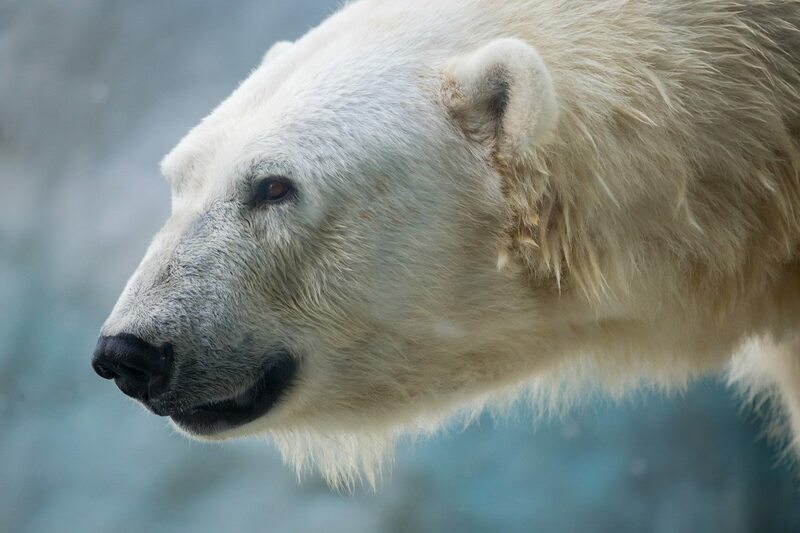 Adult polar bears are seven - eight feet long and can weigh 900-1,600 pounds. 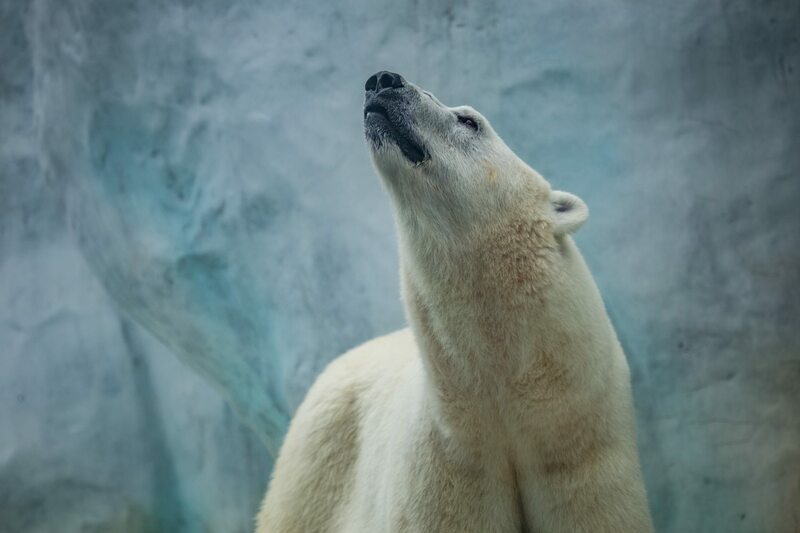 Polar bears are listed as a vulnerable species and as a threatened species under the Endangered Species Act due to loss of Arctic sea ice from climate change. 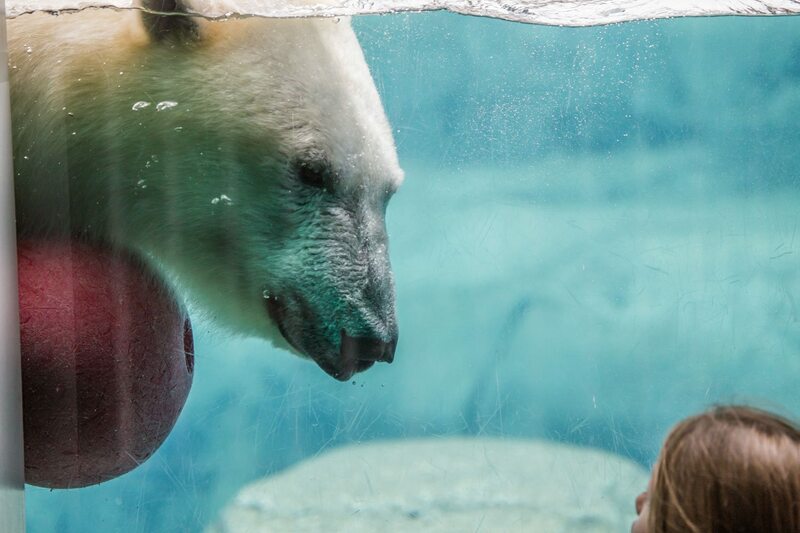 The Zoo supports Polar Bear International’s efforts to conserve the great white bear and its habitat through research and monitoring. In the past few years, the Zoo has helped purchase GPS collars and ear tags to help study the movements of bears. 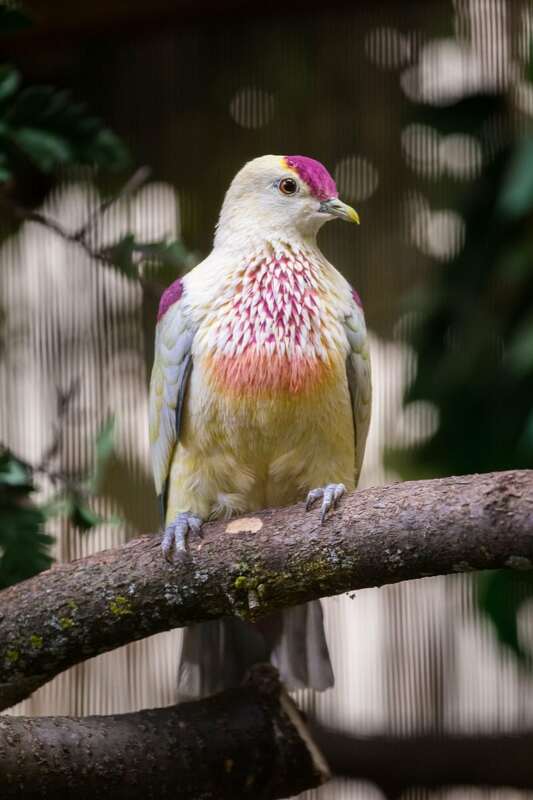 Pink-necked Fruit Doves are native to southeast Asia and the mountains of the islands of Bali, Sumatra and Java where they eat fruit and berries. As they do not eat the seeds, the Doves disperse the seeds and actually help to regrow their own food source. 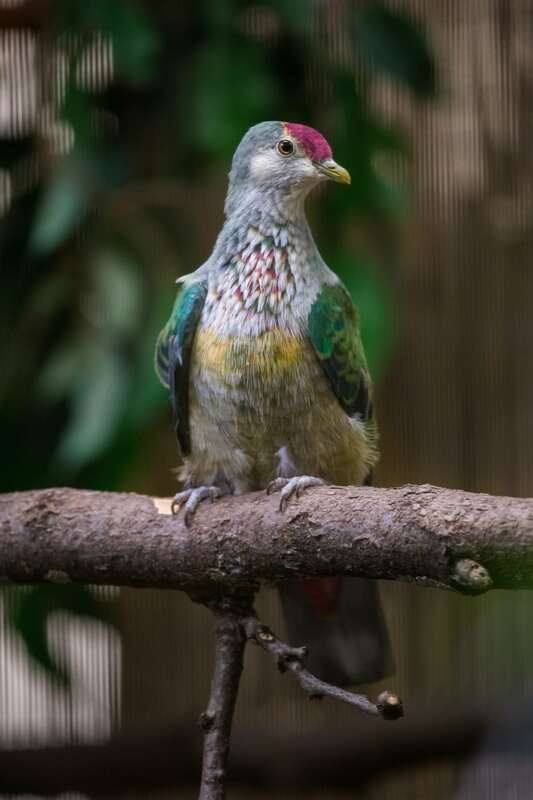 Both males and females have pink/purplish heads and necks with a white band on their chest and green, gray and yellow feathers. Males are more vibrant than females. 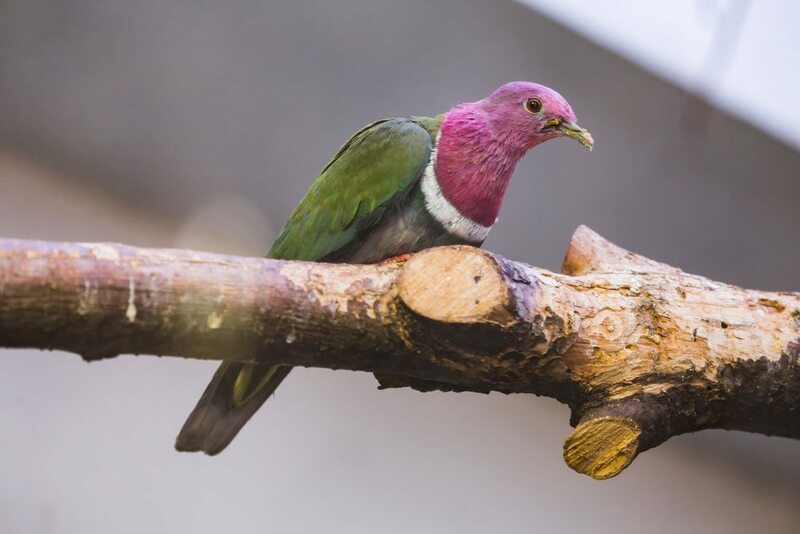 As Pink-necked Fruit Doves have a very small range and are quite shy, studying the species is incredibly difficult. While population numbers are unknown, it is thought they are declining due to habitat loss. 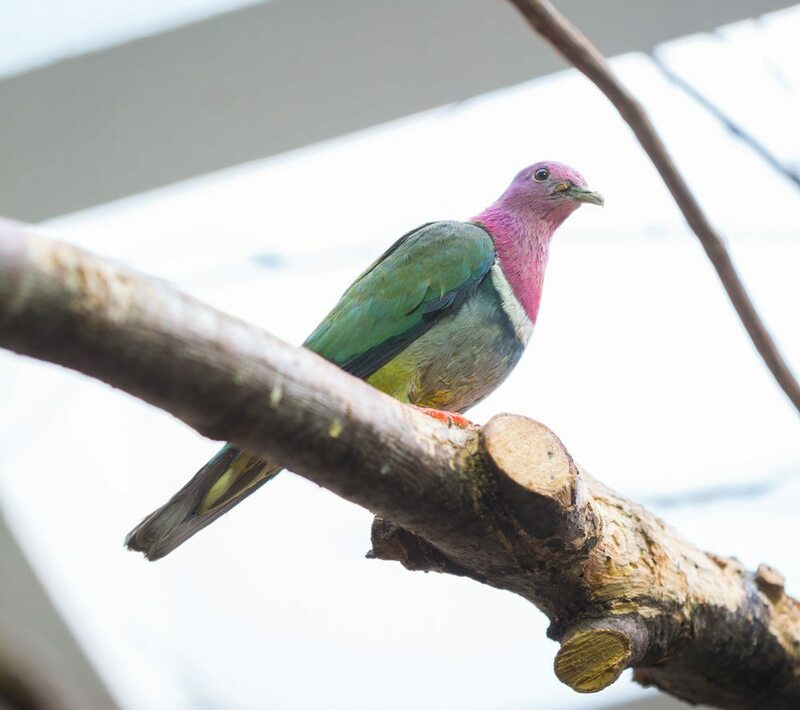 To help support the population, Toledo Zoo began breeding and rearing Pink-necked Fruit Doves in 2014 and today houses the entire AZA population of the species. Since the beginning of our rearing, hatch rates have increased from two a year to more than five. 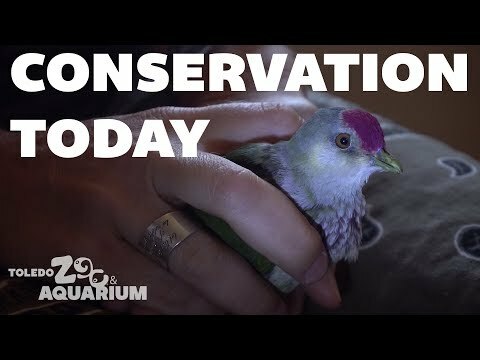 In 2017, the zoo hand-reared 14 Pink-necked Fruit Dove chicks. 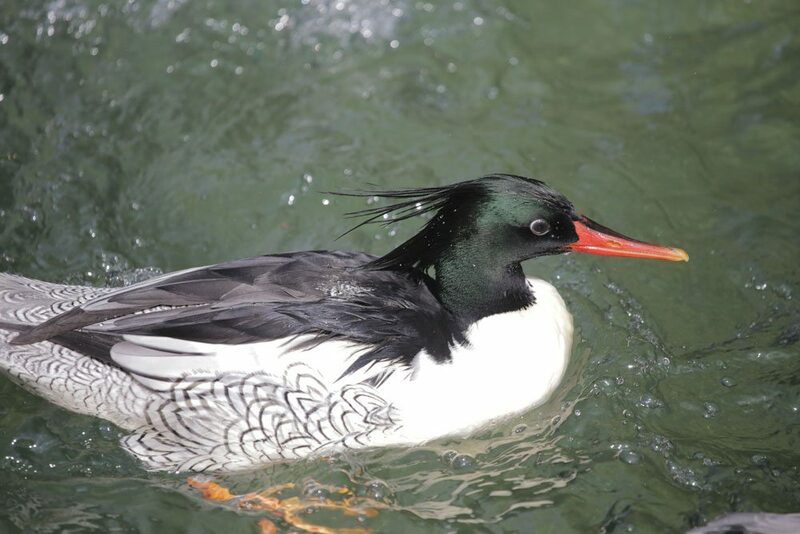 Scaly-sided Mergansers are migratory ducks that are native to far east Russia, northeast China and North Korea. The males have a long, bright orange serrated bill, iridescent green head with a crest and black and white body with scalloping that resembles fish scales. Females are similar with brown heads, a shorter crest and a gray body with less noticeable scalloping. The wild population numbers are only approximately 4,000 due to logging and fishing industries in their habitats. 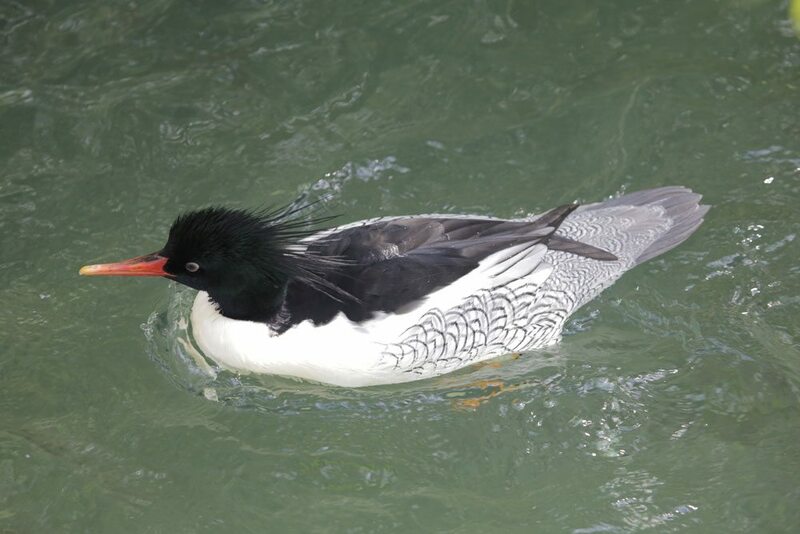 In 2014 the Toledo Zoo became only the second Zoo in North America to successfully raise Scaly-sided Merganser chicks. In 2016, the bird staff successfully raised six ducklings! Kiwi are small ratites, or flightless birds, related to Cassowary and Ostriches that prey on the many species of insects that emerge after dark. Depending on the sub-species, Kiwi can weigh two to 12 pounds and can live for 50 to 60 years. Kiwi are burrow nesters. They will hide and sleep in their burrow all day and come out at night to hunt. Kiwi have very small eyes that are sensitive to light, so they rely on their senses of smell and touch along with their long bills containing ultra-sensitive whiskers at the base and nostrils at the tip to forage for insects. Kiwi are endangered due to predation from non-native mammals, specifically stoats (a type of weasel), dogs and feral cats, in their home range of New Zealand. 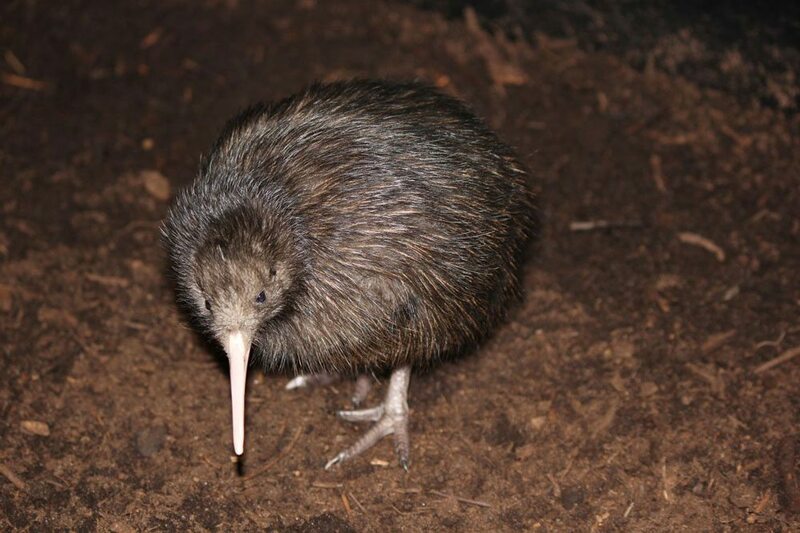 In support of kiwi conservation, the Zoo has a kiwi on display in our Pheasantry and supports Kiwis for Kiwi preservation efforts in their native range. Cuban boas are light brown or tan with dark markings and are found in the tropical dry forests of Cuba and the surrounding islands. Young Cuban boa are arboreal, meaning live in trees, while adults are more terrestrial, or live on land. Interestingly, they use their tongue to smell and help locate prey such as small mammals, birds and lizards. Cuban boas can grow to be 13 feet long and weigh up to 60 pounds. 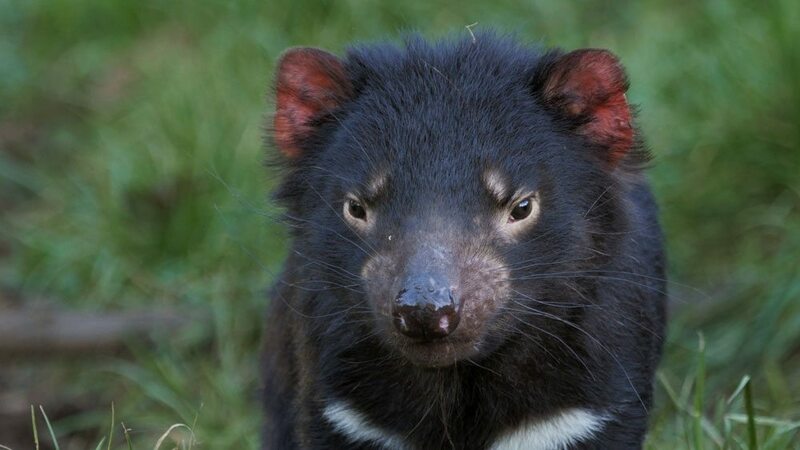 As their native range is a small island, they are easily threatened by natural disasters and interactions with humans. The Zoo is working with the US Navy to use radiotelemetry to track the habitat use and activity patterns of the largest snake in the Caribbean. 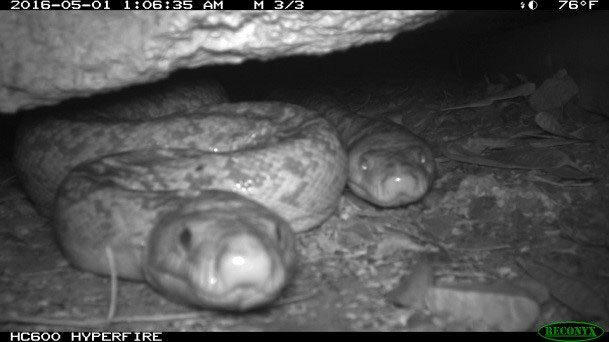 We are now concentrating on the reproductive biology of the Cuban boa, including reproductive timing & behaviors such as mate fidelity and reproductive efforts across size classes. Twenty-six boas were radio-tracked over a total of 56 days at Naval Station Guantanamo Bay in 2017. 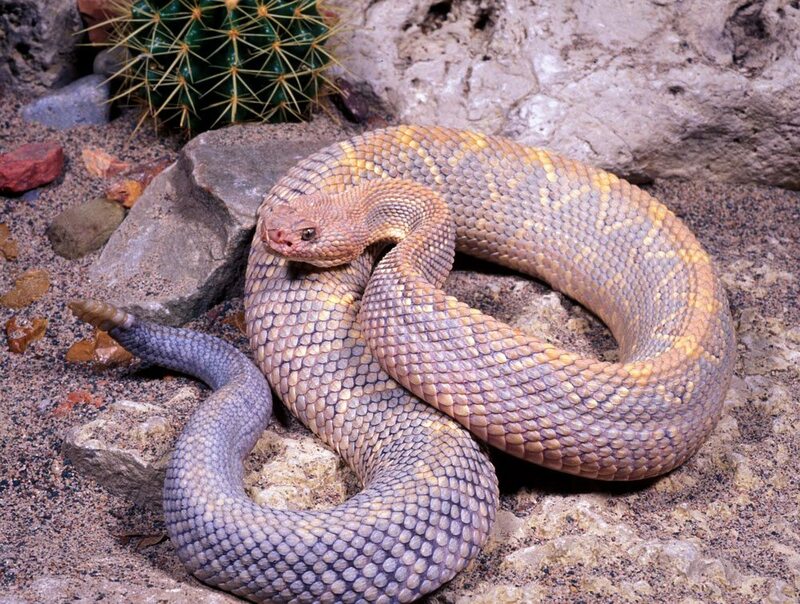 The Aruba Island rattlesnake uses heat-sensing pits on its head to help locate prey such as rodents, birds and lizards. The snake is quite colorful being light brown with pink, blue and brown diamond markings. They live in the rocky hillsides and sandy fields of Aruba and average three feet in length.  The populations is threatened by human encroachment, poaching and competition from non-native species. 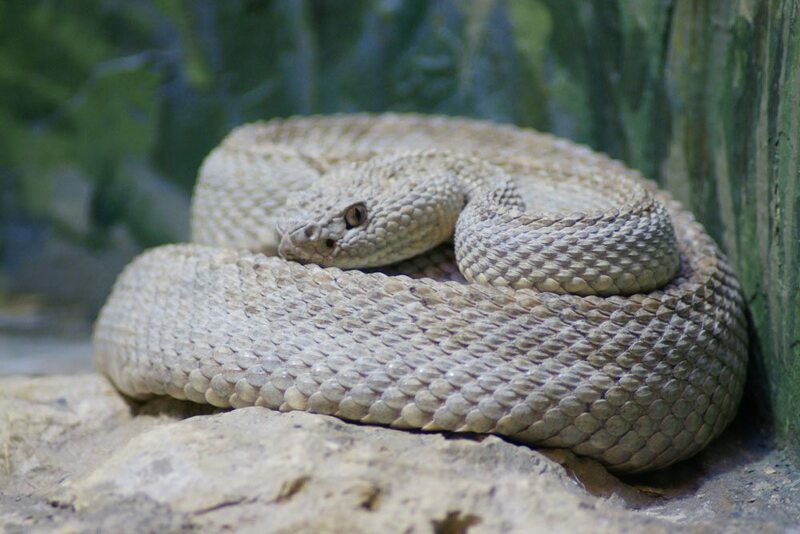 Toledo Zoo has a 28-year history of actively working on Aruba to conserve the Aruba Island rattlesnake. 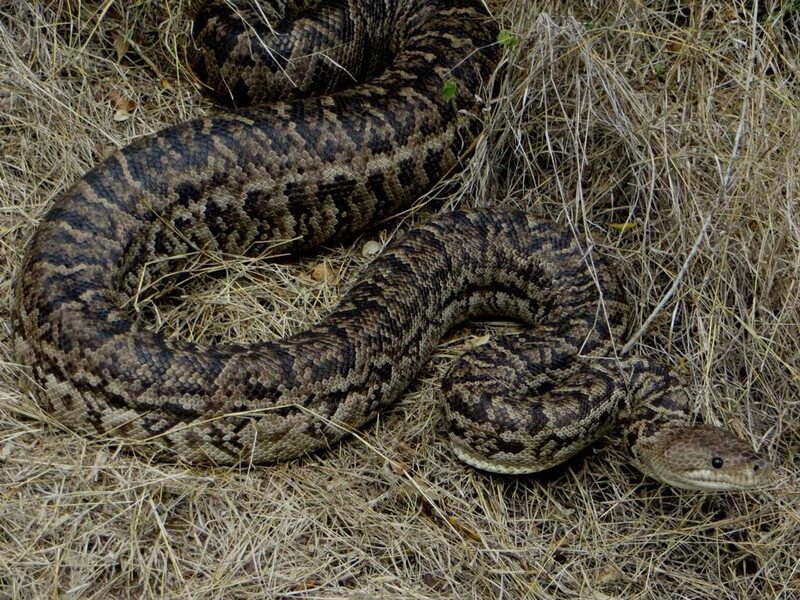 We continue to monitor the wild populations of the rattlesnake through condition indices and mark/recapture study. We are also studying the ecology of the rattlesnake’s primary food source, the Aruba whiptail lizard. In addition, a formal training session in Aruban herpetology followed up with field workshops was conducted for Aruba’s National Park personnel in 2017. Monarch butterflies are an iconic bright orange and black butterfly that undergoes the largest migration of any insect in the world, flying from the northern parts of the United States and Canada to Mexico to overwinter. Monarch butterflies have been suffering from the loss of their primary food source, milkweed, due to the use of herbicides and urbanization. Monarchs serve as the ambassador species for the Zoo’s butterfly conservation program and prairie initiative. The Zoo’s captive rearing program began in 2014 and has successfully bred, tagged and released over 2,500 monarchs for fall migration. 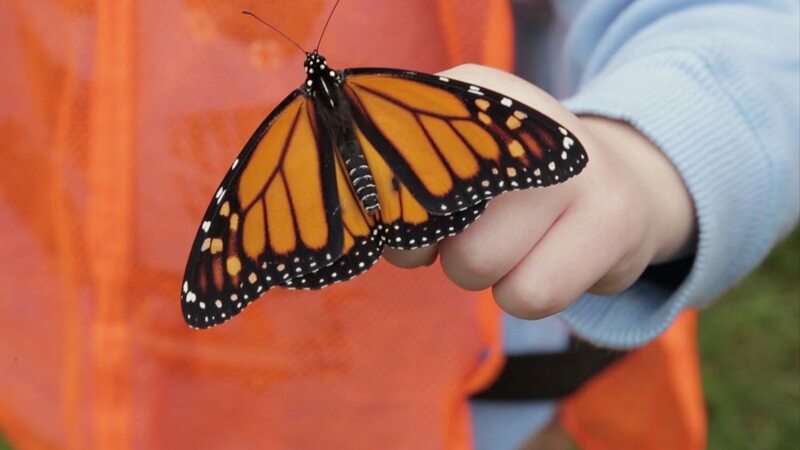 Our efforts have even garnered national attention as 21 of our 2016 monarchs were recovered at the Monarch Butterfly Biosphere Reserve in Mexico.